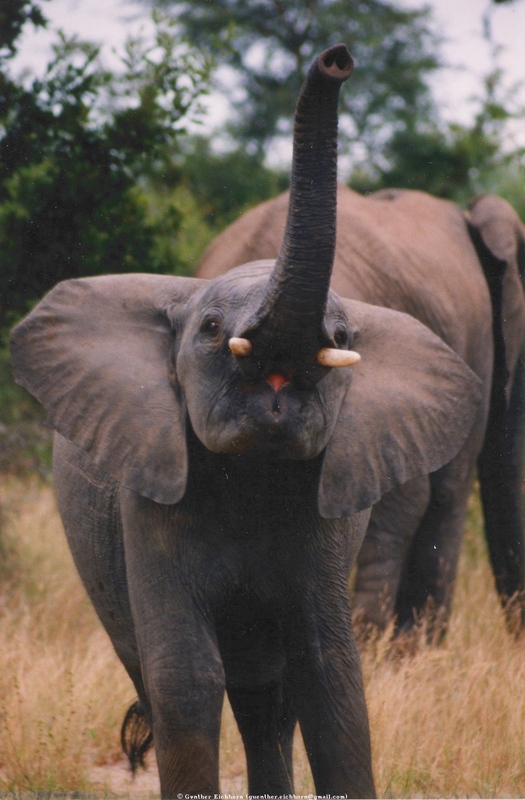 My first trip to southern Africa with its abundant wildlife was to South Africa. 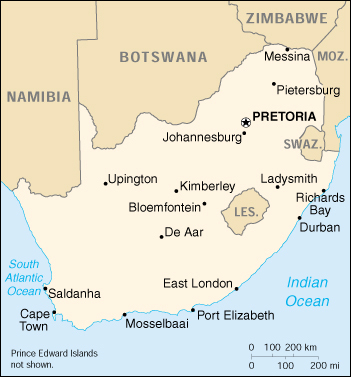 I spent a little over two weeks in South Africa in February, 1998. I flew into Johannesburg and rented a car there. I stayed in Johannesburg for a few days, including a visit to a local glider club for a glider ride, and a visit to Sterkfontein, where 2-3 million year old human ancestors were found. I then drove to the Krueger National Park and stayed there for three days at the N'Gala lodge to see some of the wildlife. It was spectacular. The guide on the excursions carries a rifle. He told us that if he ever had to use it, he would probably be fired, or at least get severely reprimanded for getting into a situation where he has to use the rifle. He is supposed to keep out of such situations. He talked about his training as a wildlife guide. They have a last exam at the end of their training. They get a rifle with two bullets. They have to go on foot into the park and shoot a male Impala (Aepyceros melampus, german: Schwarzfersenantilope, french: Impala) that is at least 2 years old, and carry it back to the lodge. They have two days to do that. They have to be far enough away from the lodge so the shot cannot be heard at the lodge. The conditions for this test all have reason behind them. The requirement for a male Impala of 2 years of age means that it is quite heavy, so they have to be in good shape to carry it. The requirement that the shot not be heard at the lodge means they have to carry it a considerable distance. To be on foot means that the animals will hide. From the Landrover you can see lots of them, but as I mentioned above, humans on foot are considered dangerous, and the Impala hide, so it is very difficult to get within range of one. And the guide has to be a good shot, he has only two bullets. He probably wants to keep one in reserve for the lions. He doesn't have to stay in the bush overnight if he doesn't get the Impala on the first day, he can come back to the lodge. It would be too dangerous to stay out there on foot overnight. We saw all the large animals (they call them the Big Five), the African Buffalo (Syncerus caffer, german: Kaffernbüffel, french: Buffle d'Afrique), African Bush Elephant (Loxodonta africana, german: Afrikanischer Elefant, french: Éléphant de savane d'Afrique), Lion (Panthera leo, german: Löwe, french: Lion), Leopard (Panthera pardus, german: Leopard, french: Léopard), and Rhino. Of these, I saw the least of the rhino, just once at night a glimpse. I had much better luck with rhinos on my trip to Kenya and Tanzania. The buffaloes are quite a sight. They can be quite dangerous, because the tend to charge first and ask questions later. They can even charge a Landrover. They always seem to stare at you, as if they are just waiting for you to make a wrong move. This was the same in Kenya and Tanzania. Elephants are spectacular. We had a funny encounter with a young elephant. He saw us, and started charging at us, ears flailing, and trunk raised high and waving. About half way towards us, he suddenly stopped, obviously realizing that our jeep was big. He lost courage and ran back to mother. It was hilarious. We saw quite a bit of leopards. One afternoon we saw a mother with two almost fully grown cubs. We watched the cubs play in trees for a couple of hours, it was fantastic. There are a lot of lions in the park. They are actually quite dangerous. From what our guide told us, there are frequently people trying to get to South Africa from Mozambique through the park. They are frequently killed by lions. There is plenty of other wildlife to see. One particularly interesting encounter was with a South African Giraffe (Giraffa giraffa giraffa, french: Girafe du Cap) that was drinking from a watering hole. The giraffe has to spread the legs wide and then bend the long neck down. They are very vulnerable in this situation, because they cannot get up quickly. Because of that, the giraffe stopped drinking immediately when we approached. It took almost half an hour before he came back, but we did get to see him drinking eventually. The most common animals are Impala. There are large herds of these in the park. There are also lots of Blue Wildebeest (or Gnu) (Connochaetes taurinus, german: Streifengnu, french: Gnou bleu), and Plains Zebra (Equus quagga, german: Steppenzebra, french: Zèbre des plaines). Warthogs (Phacochoerus africanus, german: Warzenschwein, french: Phacochère) are funny creatures. When they graze, the walk around on the knees of their front legs. And when they run, they keep their tails high. Bird life is sensational in the park. There are all kinds, from small song birds up to the big vultures and eagles. The vegetation is high grasses and low bushes with some trees. I was there during the rainy season, so everything was green. That means the animals are more difficult to see than during the dry season. One excursion was to a large watering hole. There were hippos in that little lake. Hippos are the most dangerous animals in Africa. More people get killed by hippos than by any other animals in Africa. Hippos are easily provoked and very aggressive. They are vegetarians, but when they attack a person, they can easily kill. From Kruger National Park I drove south to Cape Town. 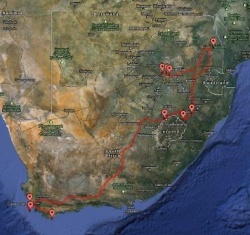 The drive to Cape Town via the Drakensberg Mountains took 4 days. It was very scenic. The Drakensberg is quite impressive. The Drakensberg Park is a UNESCO World Heritage Site. Further south, the wine area is very nice, and they have great wine. Cape Town is quite interesting too. I stayed there for another 4 days. I had made arrangements to rent a Cessna 172 for a flight around Cape Town. It was fantastic. I then drove down to the Cape of Good Hope, a very scenic drive. Altogether a very memorable vacation. The people in South Africa were very friendly. There are still problems between the races, but I had the impression that everybody is really trying to make things work out. I had a very positive impression. The pictures I took on my trip to South Africa are in several pages.